30 years, where did it go! Thirty years to the youth of today probably seems like an eternity, but, to an old 1970's rocker like me, it is a mere flicker through the window of time, so it was with great fondness that I recalled the release of The Eagles timeless album Hotel California as it celebrates its 30th birthday. Hotel California was The Eagles' fifth album, their first without founder member Bernie Leadon, but the debut for rock legend guitarist Joe Walsh who gave the band a new rock edge away from the more melodic country sound. In came rock guitar riffs with 'Life in the Fast Lane' as the classic example. The guitar solo on the title track has to be one of the best ever and the interplay between Walsh and Don Felder is exquisite providing a textured sound. 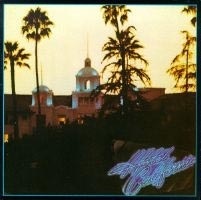 The album won the Grammy Gold Award for 1977, although none of the band bothered to turn up, had one of the most recognised album covers of all time displaying a twilight view of the mystic Beverley Hills Hotel on Sunset Boulevard. It was written as a symbolic insight into an increasingly decadent and materialistic America celebrating its bicentennial and being given a stark warning, in no uncertain terms, in the album's final epic track 'The Last Resort' to both America and The World in general of the decline that was going on in society. They showed the need to change as the poignant line 'Cause there is no more new frontier, we have got to make it here' clearly defines. Hotel California is the most well known of all Eagles songs. Its lyrics lay open to many interpretations from the simple tale of an innocent weary traveller seeking refuge to the darker side of drug addiction, 'You can check out anytime you like, but you can never leave', which is certainly an insight into the band's own habits at the time. Further, when Don Henley asks, "Please bring me my wine, he said, 'We haven't had that spirit here since nineteen sixty-nine'" is he requesting his favourite vintage from the Napa Valley or suggesting that the band had sunk so low into drug addiction that they were dreaming of those early days of the late 1960s when their spirit was still fresh? Again, with the line, 'Warm smell of colitus', Frey and Henley are actually giving reference to the Mexican word “colas” the tip of the marijuana branch where the most potent leaves grow…..apparently. There isn't really an argument, the song was simply drug inspired and, as Joe Walsh informed the audience at their 2006 Wembley Gig, "We have to take a break to use the bathroom, it's just nowadays it's for a different reason than before!" Glenn Frey takes the lead on the only 'typically' Eagles country rock sound on 'New Kid In Town', which was the only other track to be released as a UK single. Otherwise, Don Henley takes the majority of the leads and the album is better for it due to his stronger and raunchier voice. As on most rock albums, “Love” takes its usual battering with the haunting ballads 'Wasted Time' and 'Victim of Love' in which love has walked out the door leaving only destruction and despair, but there is a glimmer of hope in Randy Meisner's 'Try and Love Again' where love might just be worth fighting for, while Joe Walsh's 'Life in the Fast Lane' depicts all the disillusionment with the West Coast lifestyle. So, once again, as I sit here listening to Don Henley, I think back and remember as a young newly-wed journeying to Wembley Arena in June 1977 to pay homage to “the greatest band ever”. The raw excitement of the opening melodic bars of 'Hotel California', the lights brightening to display a monstrous backdrop of the album cover and, finally, Glenn Frey coolly announcing, "Hi we're The Eagles, we're from L.A." Thirty years, where did it go! It's a little known fact that the best ever cover of Hotel California was performed in Virrat, Finland in 2002. Ahh, yes, the classic cover of Hotel California performed by Paul Thomas, ft. Rob Jenkinson. Please contact asa@ovimagazine.com if you would like to hear the mp3.